As the name suggests, Moo Free is the dairy-free range of chocolate treats for those intolerant to cows milk, or who simply follow a dairy-free lifestyle. Their eggs feature characters such as Mikey Bunny and Clawdia Cat, which I think make great distractions to the healthy element. 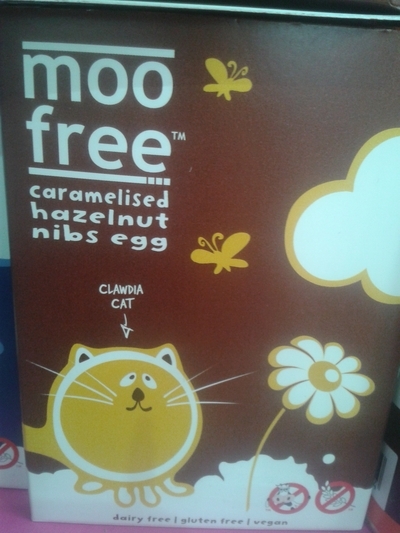 All of the Moo Free eggs have won awards, but it's the caramelised hazelnut nibs egg (£4.25), which caught my eye. My nephew claims he is 'too old' for Easter eggs, but my niece is still at that age where she loves receiving gifts - especially chocolate. Thus I bought her a Moo Free hazelnut egg because she is suddenly 'into' nuts, which is great. As an Auntie I know I'm responsible for giving my niece 'healthy' treats, so my sister advised I find a low-sugar Easter egg, if I had to buy her one. The Moo Free hazelnut egg is perfect for kids; it has great animation and paints a fun picture of a dairy-free Easter. I don't think my niece will even notice because she'll be beside herself that I have given her a chocolate egg. If your little one is allergic to dairy, or perhaps you follow a vegan lifestyle, but still want to enjoy chocolate without compromising your diet, Moo Free id definitely a delicious option. I bought myself an egg before I bought my nieces gift, just to make sure it was good enough, and I was blown away. The chocolate has a lightness to it (probably because they use rice milk), and is surprisingly creamy. The egg itself is of a typical thickness, and is hollow. The caramelised hazelnut nibs are crushed hazelnuts which have been dipped in caramel, and are 'baked' into the egg shell - it is divine. The Moo Free range extends to chocolate drops and a few bars, but their expertise lies in the making of chocolate eggs.